Let us speak for a moment about pigs. Not the two pastured pigs presently residing by the stock pond, but the pigs in the barn. It is a serious consideration for the family-scale farmer what to feed his livestock; since he is not raising his animals primarily to sell them but to eat them, it is important that they be fed for just as small a cost as possible. The meat we raise may be better than anything money can buy, but we whose means are limited cannot consider it a bargain unless we reduce the actual cash outlay to almost, or literally, nothing. This means little or no bought-in feed. So what do our pigs eat? Well, first of all, dairy waste. 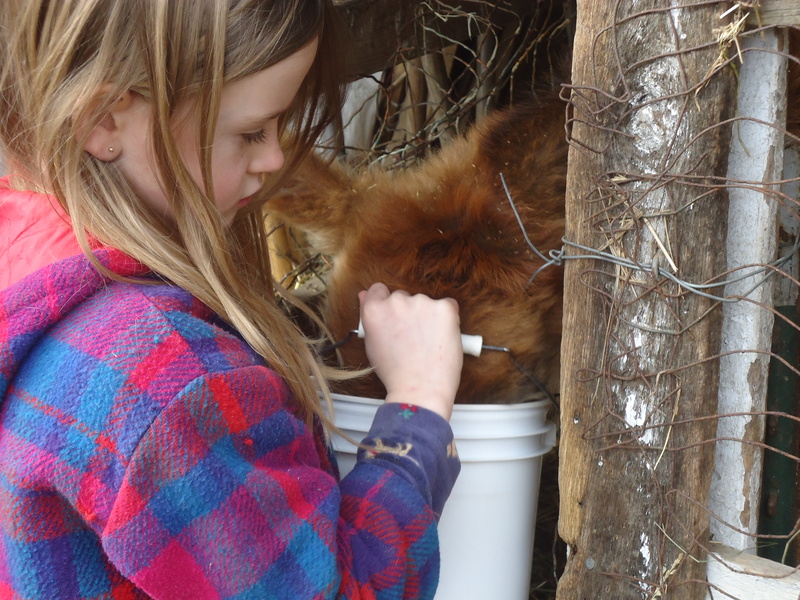 Only in a family-scale dairy, there is no waste, there are just dairy products. The ones that usually go to the pigs are whey, buttermilk, and some skim milk. Right now, with the cows either going into heat or in early pregnancy and with three baby bulls in the calf barn, there is less milk to spare than we like to see, maybe a gallon of skim every other day, two gallons of buttermilk a week, and whey only by the quart from drained yogurt. The pigs devour it. When there is no milk there is swill, or slops, the cooked vegetable and table scraps from our own and the monastery’s kitchens. This is also extremely palatable to the pigs, as well as to the chickens and dogs. There is bakery waste usually two days a week, given to us at third hand by the Franciscan sisters to whom it is delivered in black plastic trash bags. There are windfall apples by the bucketful, gathered from the trees in the pasture. These have only been ours for two years, just since we bought the field, and the pruning we have been doing, while it helps, has not yet succeeded in making the apples from those trees worth harvesting for our own use, but the bruised fruit, sweet , red and yellow, is prized by pig, chicken, and duck, miniature horse, and the cows. The garden offers many things for the pigs, and will offer more. The zucchetta rampicante, or tromboncino zucchini, which has sprawled fifteen feet out of the raised bed where it is trellised, produces far more squash than our households can use. The overgrown individuals are roughly chopped with a hatchet when we split the firewood for cooking swill and added to the mess in the big copper cauldron. Bean plants, corn stalks and tomato vines pulled from the garden are thrown in the pig pen where what is not eaten becomes bedding, trampled and chewed to shreds. In the monastery garden ranks of beets and turnips, maybe a thousand row feet or more, fill the open spaces left when the potatoes were harvested, and these are intended for the pigs winter food. And the late beans, when we have had our share, will provide good protein for all the pigs on the farm. This last item seems to us a good idea, and next year any spaces left empty before the middle of Augusts will be sown to pintos as fodder for the pigs and cattle. Corn stalks. There is a big stack of these in a spare stall, and we throw in six or seven every day or two. They must be getting eaten, because anyone who has cleaned a stall where they were not getting eaten knows just how miserable and tangled the bedding gets, and the bedding in the pig pen is loose and duffy, with only a few fragments of cornstalk in it. Windfall apples. Our farm has five apple trees within forty yards of the pig sty. 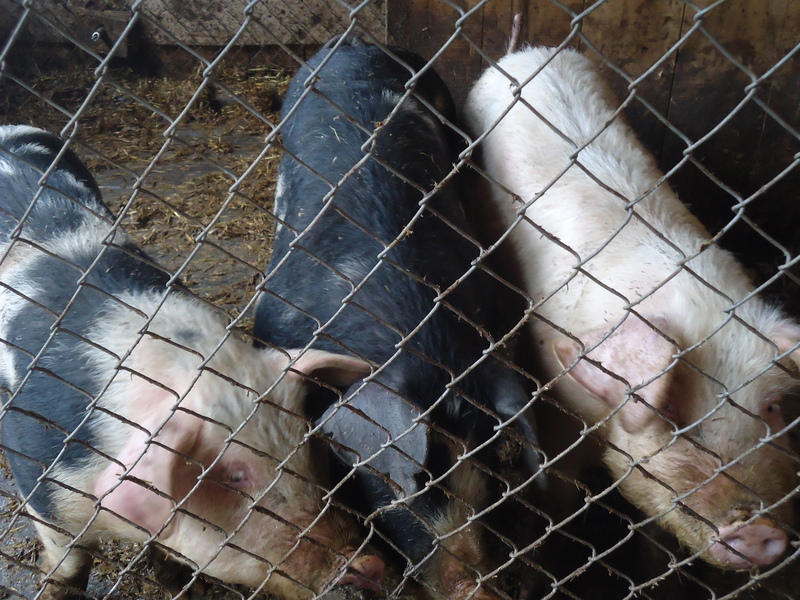 Piglets who run from a human being at the fence will poke their noses through the gaps in the wire when offered a slice of apple taken off with someone’s Uncle Henry. In the season there is always a bucket or two of windfall apples beside the pig pen, and passers-by hand-feed them to the babies, or tip a dozen over the fence if in a hurry. Apples are good pig food, at least so say the pigs. Swill, slops, garbage, whatever name you give it, waste food from cooking and the table is good pig calories. We boil it in a big kettle to increase its appeal – pigs and chickens prefer cooked scraps to a jumble of vegetable waste and leftovers – and the pigs eat it enthusiastically. Skim milk, buttermilk, whey – dairy waste of all kinds. Particularly good is to keep a bucket of skim milk by the wood furnace where it will clabber overnight into a thick yogurt full of beneficial lactobacilli and nourishment. Bakery waste. Some kind soul in the city brings bags of waste from a gourmet bakery and gives them to the sisters at the monastery; what cannot be utilized there often ends up at our farm, where the pigs love it soaked in milk or warm water. Chickens love it too. Cooking water. When we steam or boil anything – except pork – the water is saved and added to the swill bucket at the foot of the basement stairs. Pasta water is starchy and full of calories, but the water from boiling corn or steaming green beans is not to be despised, being full of flavor as well as – so nutritionists who want us to eat our vegs raw will tell us – all the vitamins leached from the vegetables. Hay. Yes, hay. Pigs like grass and will eat a good deal of the waste hay from the cows’ manger. Weeds pulled from the pasture in a spare moment. Wheelbarrow loads of weeds and vines and half-spoiled vegs from the garden. That’s all that comes to mind at the moment, but it gives you the idea. The young cabbages are set out and watered with the hose off the creek. Constantly running water – free, and not drawn off the aquifer – is a blessing we feel every day. Eight dozen cabbages and seven hundred row-feet of carrots, mostly Napolis, need lots of water, every day even, water we could not give them from the house well even if we wanted to burn electricity to do it. We are properly grateful. In October we will cover the winter vegetables with low hoops and row cover; in November, or December if the cold holds off, we will cover them again with high hoops of welded wire and six-mil poly twenty feet wide, making a high tunnel about five and a half feet tall and almost ten feet wide. That’s a big tunnel, much bigger than last year’s, and we hope it works. In a high wind it could be a disaster. The big pile of waste wood at the foot of the hill, in the curve of North creek we call “the bonfire pit”, has been reduced to a thin layer of cinders edged by a few half-burned lengths of two-by-four. It went up in flames thirty feet high, lighting the whole valley with tongues that tore loose from the parent fire and expired in showers of sparks. The alchemists of the Middle Ages who classified all matter as either Earth, Air, Water, or Fire, can’t have been too far wrong; at the Sow’s Ear fire is employed almost as often as the other three, multiple times a day. In the kitchen, of course; and under the fifteen-gallon brass kettle out back where we cook swill for the pigs and chickens. In the oil lanterns we carry down to light the way when we close up the ducks and chickens, and in candle lanterns on the porch for prayers. In the grill to sear the good red meat that, with potatoes and fresh vegetables, refuels us after a day of hard work. In the rock oven by the creek for hot dogs and marshmallows; and, as last night, for joy, and to clear the farm of those things, comparatively few, which cannot be recycled and for which we can no longer find a good use.